Bellwether, Inc. was first conceived in 1974 and launched in 1975. It was goal of the founding family to create a manufacturing source for specific types of replacement parts for certain types of textile machinery. The first products were introduced in 1976 after about two years of development, and the product line was an immediate success within the target market. Growth followed through 1981, when the housing market went into a temporary tailspin (The company's product line was closely tied to the carpet industry) and the decision was made to expand into the textile industry as a whole. Years of endeavor and expansion followed, and by 1991 Bellwether had captured over 70% of the original target market. In the latter part of the 1990's, the textile industry was beginning to taper off rather dramatically, so Bellwether decided to diversify into other industries. Over the years, production of parts for pumps, oil and gas production, medical, automotive, heavy equipment, commercial products of various kinds, and aerospace uses were developed. Today, Bellwether is still owned by the founding family and continues to be operated as a family business. Perhaps the proudest achievement of this time is the fact that, as of 2020, the company will have a number of employees that have completed 35 years of service with the company, and another group that has completed 25 years. 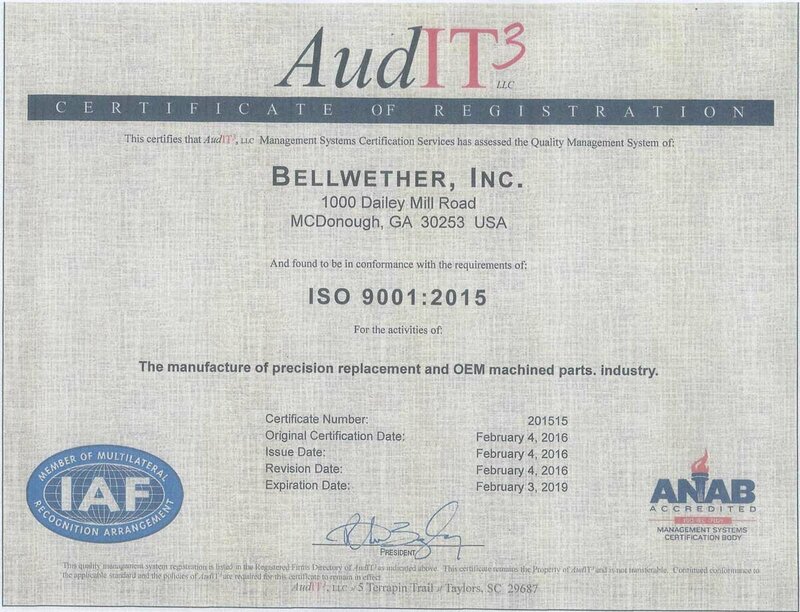 Bellwether also boasts several companies that have been customers for over 20 years, relying on Bellwether's manufacturing expertise and up to date production facility for the sort of high quality parts, tooling and fixturing needed to complete virtually any manufacturing task. Look for more posts about our history, manufacturing practices and beliefs in the weeks to come.